Ten years after the first lectures began at the University of Adelaide, the School of Music was established. Many South Australians, including composer and former Governor Sir William Robinson, had agitated for such a school. Its founding in 1884 was widely celebrated. However, it would be another 14 years before the school had its own conservatory. In 1898, South Australian pastoralist and businessman Sir Thomas Elder left a large bequest to the University of Adelaide. This made it possible to build a new School of Music, Fittingly, it was named Elder Hall. Designed by F.J. Naish, the new music hall’s design was described as a plain “Florentine Gothic”. It could accommodate 1000 people, with the orchestra and chorus room holding 300. It seems the hall’s opening was celebrated at least twice before the Governor, Lord Hallam Tennyson, officially opened it. “Now I am asked to reopen it positively for the last time,” he noted at the ceremony on 26 September 1900. This opening was a grand occasion, with students from the school performing the songs Jack Tars and Hands all round. At the time more than 250 music students were enrolled. Elder Hall was also used for degree ceremonies and examinations until Bonython Hall was completed in 1936. It is still the home of the University of Adelaide’s Conservatorium of Music and hosts regular public musical performances. 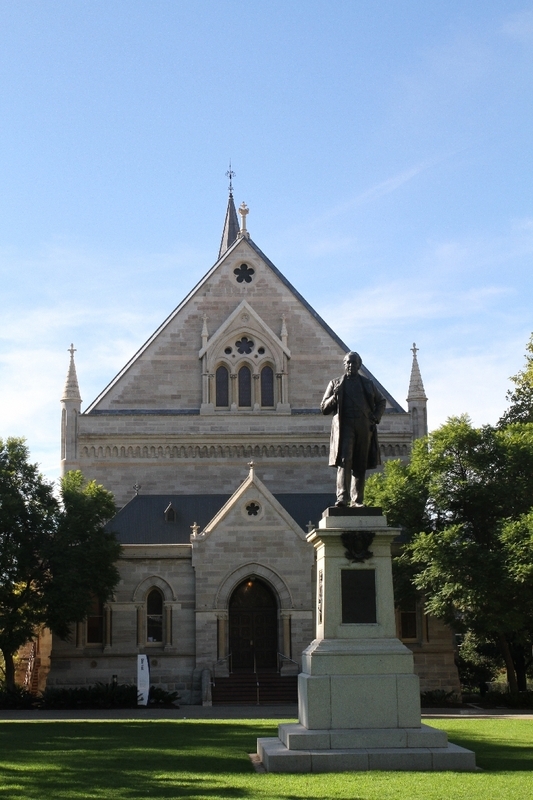 “University of Adelaide: Elder Hall,” Adelaide City Explorer, accessed April 26, 2019, https://adelaidecityexplorer.com.au/items/show/87. Marsden, Susan, Paul Stark, Patricia Sumerling (ed). Heritage of the City of Adelaide: An Illustrated Guide. Adelaide: Corporation of the City of Adelaide, 1990.